MT provides you with a private, secure high-performance connectivity specifically designed for your sites, proactively managed round-the-clock by our team of experts from our Service Management Centre (SMC). 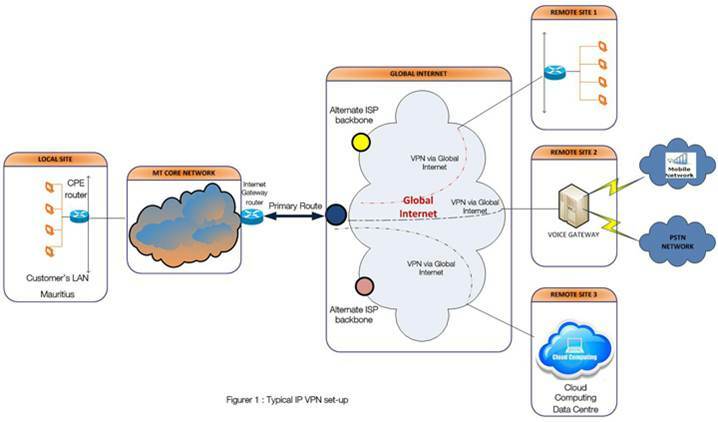 WAN VPN is Private IP VPN service based on Layer 3 MPLS (RFC 4364) Network. The Virtual Route Forwarding (VRF) function offers the flexibility for multipoint to multipoint connectivity with each customer having his own separate secured network including possibility for second Access Circuit for load sharing (Active/Active mode) or hot Standby (Active/Standby mode). WAN VPLS is a multipoint to multipoint networking service over a Layer 2 MPLS (RFC 4762) Network. It provides a scalable and secure infrastructure for customers to extend their multi-site LAN transparently. It is ideal for customers interested to do their own routing across the WAN. EVLL is a transparent point to point Layer 2 networking service simulating a leased line. It is ideal for DC/DRC connectivity for LAN extension or for networks with high data security requirements. Each service above comes standard with Normal Data QoS. Customers can add Voice or Video QoS to any of the Circuit at a nominal additional monthly charge. 24/7 Site Intervention for Access Circuit repairs with a Target Repair Time (TRT), else Customer is eligible for Service Credits. Dual Router, Dual Loop, Dual Homing, Medium Diversity to build site resiliency. Contact us on 8901@telecom.mu for a quote. FAQs on Managed local WAN? For help & support for your existing WAN lines, call our fault reporting hotline 8919.